EX- manager Emma Carols (left) with Kalifah Aganaga (right). The duo has parted ways. Photo by Paul Ibanda. According to information PML Daily has obtained, prominent dancehall artiste Sadat Mukiibu aka Kalifah Aganaga has fired his longtime manager Emmanuel Mulondo aka Emma Carlos. Aganaga accuses Emma as he is popularly known of embezzlement and unfair business dealings. The dancehall artiste also accuses Emma of diverting his concert and music promotion money for his personal use, something the struggling artiste says has ruined his music career. 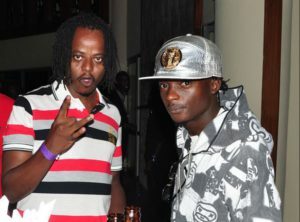 Apparently, Aganaga has appointed his longtime music producer ‘Nash Wonder’ as his personal manager. Aganaga further described his former manager as incompetent, extravagant and selfish, adding that he is only interested in milking the cow without feeding it. Emma, who is also nursing injuries from an accident he was involved in recently, is also accused of making a star of Aganaga’s caliber use public means after a gig in the West Nile region. Our snoops have since learnt that Emma is on the run after police in Nansana summoned him to answer charges of obtaining money by false pretense.